Equal parts sophisticated and bohemian -with a touch of vintage inspiration- Kris Nations delivers a full collection of jewelry designed for the confident woman with a personal style that transcends time and trends. Created by sisters Kim and Kris Nations, the pair draws inspiration from their unique, free-spirited sense of style, as well as another common bond: their family. When starting the brand back in 2004, Kris and Kim turned to their own mother when developing their design aesthetic. "Our mom is independent, creative and has a great sense of style," says self-taught artist Kris, who was encouraged by her mother to begin creating her own jewelry as a teenager. As siblings that have been designing together for the past 11 years, it's no surprise that sharing ideas and polishing concepts until a truly collaborative design emerges comes as second nature to the Nations sisters. Hand-made entirely from recycled metals in the USA in their Half Moon Bay, CA studio, Kris Nations' jewelry pieces combine Kim's retro-modern aesthetic with Kris' flair for color in surprising combinations. Show your hometown pride with the State & City Pride collections, or add some charm with the Angel Fire or Ventana pendants, bracelets and more. Enhance your personal style with Zodiac bracelets or Initial and Birthstone necklaces. 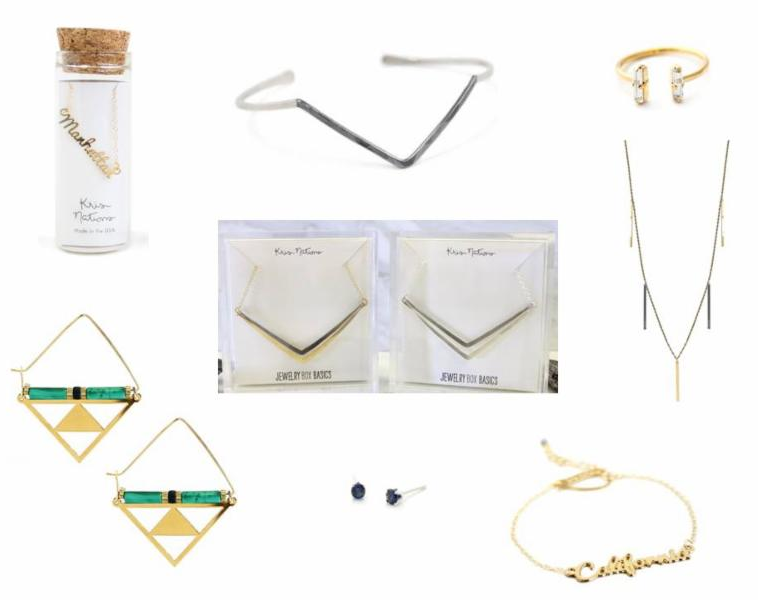 You'll also be sure to stay on-trend with bracelets, earrings and rings featuring fun, geometric shapes. Gift-giving is also a breeze, thanks to Kris Nations' perfectly packaged glass bottles and Lucite boxes. ($35-$95; www.krisnations.com).